Suffolk Analysis Projects Spending Only $17.60 Per Week on Locally Grown Food Could Generate $33 Million in Economic Activity. Suffolk County, NY - July 13, 2018 - Suffolk County Executive Steve Bellone today announced the launch of ChooseLI.org, a collaborative effort that seeks to raise awareness, advocate and inspire the community to support local and independent businesses on Long Island. Residents can “Take the Pledge” and commit to spending 10 percent of their weekly food budget on local and seasonal food and beverages across Suffolk County. In addition to the County, the initiative partners include the Long Island Farm Bureau, Long Island Commercial Fishing Association, Long Island Wine Council, Peconic Land Trust, Discover Long Island, Cornell Cooperative Extension of Suffolk County, Island Harvest, Long Island Food Council, NY Sea Grant, and NYS Agriculture and Markets. The coalition asks local residents and visitors to choose goods from local and independent farmers and fishermen to preserve Long Island’s heritage industries and cultivate a vibrant, diverse and robust economy. The Choose LI website will include a complete mapping and inventory of all the farmstands, farmers’ markets, fish markets, vineyards, breweries, and cideries in Suffolk County for residents. Additionally, the website provides residents with information on what types of products are available during the season. Residents are encouraged to “Take the Pledge” and commit to spending 10 percent of their weekly food budget, approximately $17.60, on local and independent food goods. The website also has a section for local Suffolk County food businesses to sign up as partners with ChooseLI, completely free of charge. Businesses can consider creating promotional specials using the #1760 and #ChooseLI hashtags to help pledgees meet their weekly commitments. Eleven local food businesses, including HOG Farm, Haskell’s Seafood, OurHarvest.com, Milk Pail Fresh Market, Southold Bay Osyters, Lenny Bruno Farms, Three Village Farmers Market, Sacred Gardens, Jamesport Farm Brewery, Gabrielsen's Country Plant Farm and North Fork Chocolate Company, have already joined. According to the United States Bureau of Labor Statistics, New Yorkers spend approximately $176 a week on food. An analysis done by Suffolk County’s Department of Economic Development and Planning states that if just 10 percent of the over 450,000 household located in Suffolk County commits to spending 10 percent of their weekly food budget on local food and beverages over a typical harvest season for Suffolk County, that spending would add an estimated $19 million into the Suffolk County economy. This $19 million in direct spending would create $33 million in total economic activity and create nearly 1,000 local jobs. Suffolk County’s rich agricultural and fishing heritage helps sustain the County’s economic growth by generating tourism dollars, supporting local restaurants and service industries, and providing fresh produce for residents. Suffolk County has 39,000 acres of farmland, 36,000 of which are actively farmed, and 20,000 of which are permanently preserved through County, Town, and private land preservation programs. Suffolk County is home to over 600 farms, which employ more than 5,000 people. The County’s fisheries contribute to Long Island’s $5.5 billion tourism industry with ocean-related businesses generating over $1 billion in goods and services for the County and employing nearly 32,000 people. Currently, there are over 700 Suffolk County commercial fishing establishments, which are responsible for over $35 million in direct revenues, creating nearly $92 million in economic activity and over 1,600 jobs. The County has approximately 60 vineyards and tasting rooms, 34 craft breweries, 2 cideries, and 4 distilleries. Michael Tucker, President, Long Island Food Council said: "The Long Island Food Council is excited to partner with Choice LI initiative to foster local buying. This is an important program that will help local Food & Beverage companies grow." For more information on Choose LI, visit ChooseLI.org or on social media at Facebook, Twitter, and Instagram. 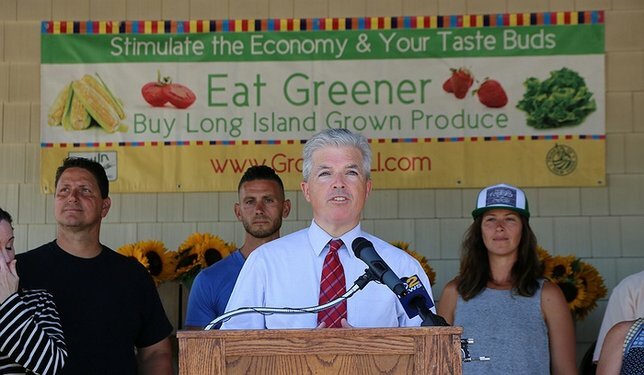 Subject: LongIsland.com - Your Name sent you Article details of "Suffolk County Executive Bellone Announces Launch of “Choose LI – Local and Independent” Campaign to Promote Suffolk Agriculture and Fishing"